Taste So Good, They'll Make You Cry! Onions not only provide flavor, they also provide important nutrients and health-promoting phytochemicals. High in vitamin C, onions are a good source of dietary fiber, and folic acid. They also contain calcium, iron, and have a high protein quality (ratio of mg amino acid/gram protein). Onions are low in sodium and contain no fat. Onions vary in color, flavor, time of year harvested, and size. These differences make onions very versatile. It is presumed our predecessors discovered and started eating wild onions very early AE long before farming or even writing was invented. Very likely, this humble vegetable was a staple in the prehistoric diet. Onions contain quercetin, a flavonoid (one category of antioxidant compounds). Antioxidants are compounds that help delay or slow the oxidative damage to cells and tissue of the body. Studies have indicated that quercetin helps to eliminate free radicals in the body, to inhibit low-density lipoprotein oxidation (an important reaction in the atherosclerosis and coronary heart disease), to protect and regenerate vitamin E (a powerful antioxidant), and to inactivate the harmful effects of chelate metal ions. Sulfuric compounds. To cut down on the crying, chill the onion and cut into the root end of the onion last. 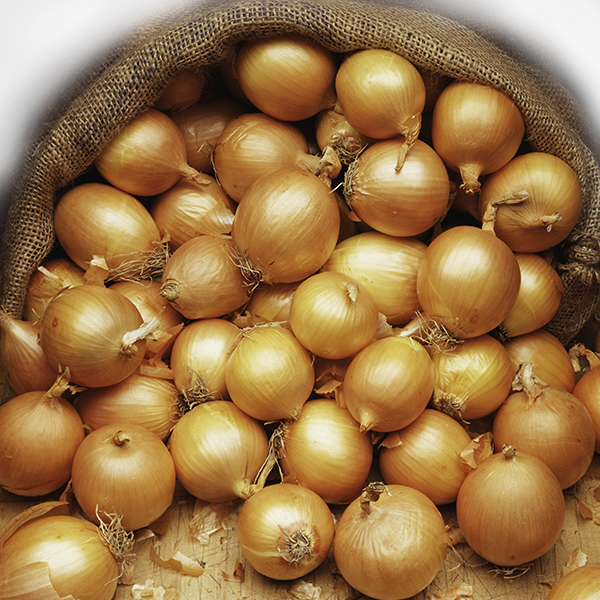 How many pounds of fresh and storage type onions does the average American eat per year? 20 pounds. How many truckloads of onions are consumed each day? Libya, with 66.8 pounds of onions consumed per person each year. A single serving of onion contains how many calories? What are the three colors of onions sold in most grocery stores? How many acres of onions are planted in the United States each year?